Bringing a Photograph into Clearer Focus: Update to a Library of Congress’ Bain News Service Collection Photo “Armenian Refugees...Date Created/Published: [1920 Dec. 3].” In a quite good German work, which apparently utilized the Armin T. Wegner archives [Nachlasse] and Wegner Photo Copyright holder Wallstein Verlag information, we see a slightly different view of the same scene dated as from autumn of 1915. The caption includes the statement that the “Death rate in these camps was extremely high [Die Todesrate in diesen Lagern war extrem hoch. 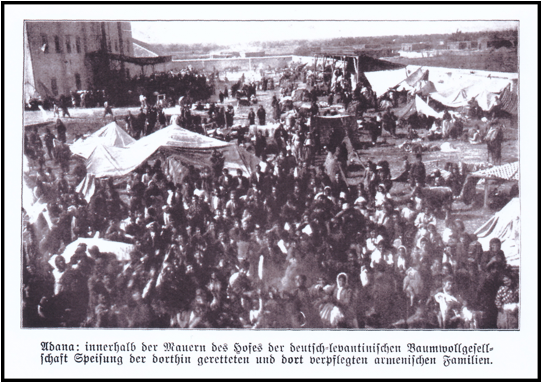 ]© Wallstein Verlag, Gottingen.” Both shots are of Armenians encamped at a relief and food station on the grounds of the German Levant Cotton Company [Deutsche-Levantischen Baumwollgesellschaft] in 1909 at the time of the Adana/Cilician massacres. The Library of Congress is an incredible resource for all kinds of things. For example, its online catalog of Prints and Photographs has allowed people to obtain quality images at no cost by mere downloading. Copies of images that are not digitized may be ordered by users for a price. In fact, in the course of our studies, we have done just that, and in so doing have simultaneously made available to others at no cost a few well-known photographs that have even found their way onto book dust jackets. By paying to have an item digitized the first time, the photograph eventually ends up in the pool of those already digitized, and thus becomes accessible to those who might otherwise not wish to pay the price. They are not inexpensive. Such efforts have to start somewhere. We wish more people would do so. There remains much to digitize, study and learn from. Seemingly disparate and disconnected bits and pieces of information thus eventually contribute to a more accurate and broader perspective than was hitherto attainable. It can be likened to the peeling back of the leaves of an onion bulb. More and more detail and nuance emerge. This is quite remarkable in and of itself. Again and as we have stated time and time again, and again in the epigraph at the outset of this presentation, the reality of the Armenian Genocide does not rely on photographs or imagery. It would be nice, however, if people would be a bit more careful in their selection of illustrative matter. Recently we wrote a short paper entitled “Correction to a Photograph of “Armenian Widows with their Children” Wrongly Dated 1915. It actually dates from 1909. Plus a comment on why it is important to get an accurate ‘paper trail’ for photographs” and had it posted on Groong on 22 September http://www.groong.com/orig/ak-20150922.html. In this posting we now draw attention to the availability of a photograph pertaining to the period of the Adana massacres and relief measures. It may be found in a number of publications with varying interpretations as reflected with captions, some cautionary and others less so. Each of the descriptions provided hitherto are more or less justified based on the information available at the time, and it is in the context of how things can fall into place with chance and some good fortune. Tessa Hofmann and Gerayer Koutcharian in their pioneering paper on photographs that “Horrify and Indict” published in 1992 in The Armenian Review specifically emphasize this fact. One view of the photograph of concern to us here is their Fig. 42 on page 105. It is labelled “Stop of a deportation convoy in a city (Aleppo?) Armin T. Wegner Collection.” --note the question mark. The photograph is small and bears no caption but appears to be included under the rubric of the grouping “Caravane della Morte/The death caravans” which starts on page 88. Many of the photographs in that publication are fortunately now on-line at a Working Group website entitled ARBEITSGRUPPE ANERKENNUNG - GEGEN GENOZID, FÜR VÖLKERVERSTÄNDIGUNG e.V. (AGA) located at http://www.aga-online.org/genocide/armenians.php?locale=en. The site uses German and English etc. On that site the photograph is captioned as Zwischenstation von Deportiertenkonvois in einer Stadt Ref-Nr. img034. [Stop-over or Way Station of a Deportation Convoy in a city [place not specified]. Sounds reasonable but not at all accurate. Obviously, we have no idea as to the origin or motivation of this caption. It does not matter. We can now concentrate on a more precise understanding of the photograph. Let us start off with the scan offered by the Library of Congress. More information is provided from the Library in Endnote . The main point that we wish to emphasize is that the people who wrote up the descriptor were totally responsible and worked with what seemed to be accurate information. Enter into the picture Ernst Jäckh. In a work that was published in 1911 in seemingly two identical releases except for a slight variation in title, we see the photograph reproduced on a page facing page 111. Below on the left is the title page of a softbound copy of “Under the Crescent” with 70 images. 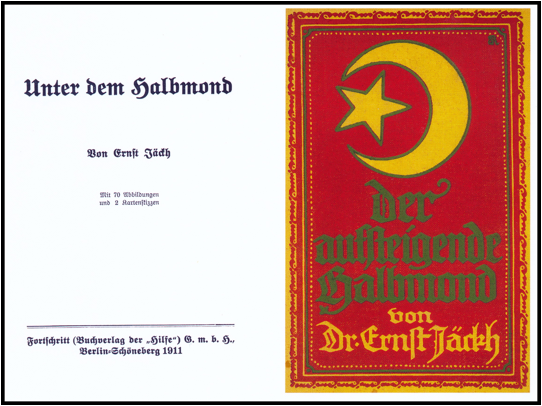 On the right is the cover of a hardbound copy of the same work entitled “The Rising Crescent.” Both works are identical as to pagination and contain a reproduction of the photograph under consideration in this contribution. We have been unable to locate a copy with the title shown on the left catalogued. We own a copy. The issue with the cover shown on the right is also from a copy we own. Below is the title page of Z. Duckett Ferriman’s 216 page book. 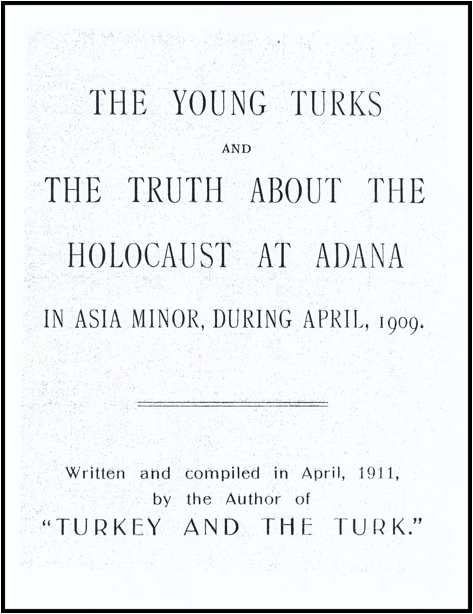 It is of significance that Ferriman refers to the “Holocaust” at Adana. 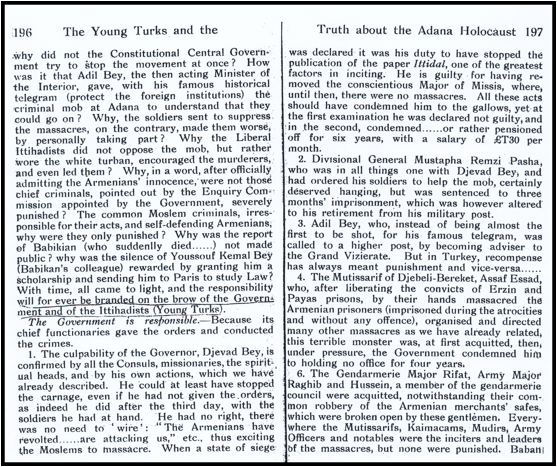 This is not the first time reference was made to an “Armenian holocaust.” A front page notice, New York Times 10 September 1895 was entitled “Another Armenian Holocaust…” A quick look at newspapers covered in the Library of Congress’ Chronicling America will show that reference to “Armenian Holocaust” continued in some papers well into 1897. Bedros Der Matossian’s Shattered Dreams of Revolution. From Liberty to violence in the late Ottoman Empire (Stanford University Press, 2014) will provide interested readers a careful analysis of the events leading up to the massacres. 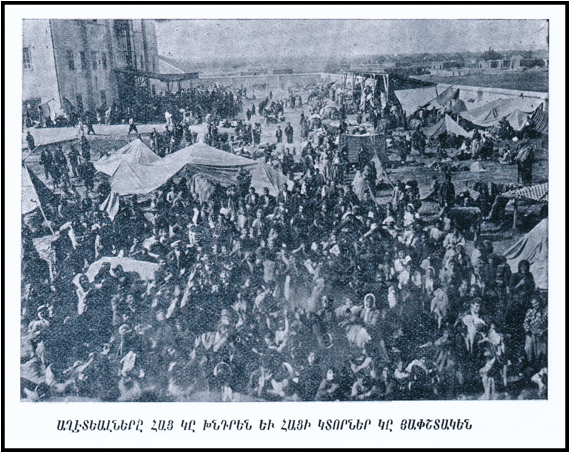 To return to the topic of ‘our’ photograph in a more narrow field of focus, a 1912 work in Armenian includes the image. It is not very well reproduced but certainly it is easy enough to make out. Its Romanized title in World Cat is given as “Kilikioy Aghete…by Hakob H. Terzean.” Readers of western Armenian would refer to it as “Giligio’ee Agheduh”… by Hagop H. Terzian (Constantinople or Bolis). “Illustrated with photographs.” (Second Printing). We have established that the photograph at the Library of Congress appeared considerably earlier than has hitherto been supposed. It clearly relates to the relief efforts for the Armenian people who escaped with their lives, and found some support and relief at a specific site. Clearly there is more work to do. The figure of seventy Moslems given by Dr. Shepard may well be true. Since we are not concerned here with those hanged, although we have been concerned with photographs of various hangings carried out during the various and sundry “persecutions” , we must perforce at least try to end on a realistic note. The image below provides two pages from Z. Duckett Ferriman’s 1911 work (shown above). If one were to go by what he states, one could say that the ‘big-shots’ escaped hanging, and perhaps those who were hanged were lower level scapegoats. We view our work as attempting to clothe accurately with pictures the plethora of words associated with the Genocide against the Armenians by the Turks. For some of the results of our efforts see `Witnesses' to Massacres and Genocide and their Aftermath: Probing the Photographic Record on Groong Armenian News Network at http://www.groong.com/orig/Probing-the-Photographic-Record.html . Also, Abraham D. Krikorian and Eugene L. Taylor (2011) “Achieving ever-greater precision in attestation and attribution of genocide photographs” in T. Hofmann, M. Bjørnlund, V. Meichanetsidis (eds. ), The Genocide of the Ottoman Greeks, Studies on the state sponsored campaign of extermination of the Christians of Asia Minor, 1912-1922 and its aftermath: history, law, memory (New York and Athens: Aristide D. Caratzas); Abraham D. Krikorian and Eugene L. Taylor (2015) “United States Consul Leslie A. Davis’ Photographs of Armenians Slaughtered at Lake Goeljuk, Summer 1915” in Festschrift Wolfgang Gust zum 80. Geburtstag (Muriel Mirak-Weissbach, ed., Verlag Dinges & Frick, Wiesbaden, pgs. 169-197). The Armenian Review, 45, 53-184. Armin T. Wegner, A.M. Samuelli (1996) Armin T. Wegner e gli Armeni in Anatolia, 1915: immagini e testimonianze = Armin T. Wegner and the Armenians in Anatolia, 1915: images and testimonies (Milano: Guerini e Associati). Rolf Hosfeld, Ed. (2013) Joannes Lepsius ̶ Eine deutsche Ausnahme. [“Johannes Lepsius ̶ a German extraordinaire”] Der Völkermord an den Armeniern, Humanitarismus und Menschenrechte. [The Armenian Genocide, Humanitarianism and Human Rights] Wallstein Verlag, Göttingen. Notes: Title from data provided by the Bain News Service on the negative. Date from print of negative in PR 06 CN 133, Container 5, Folder 9. 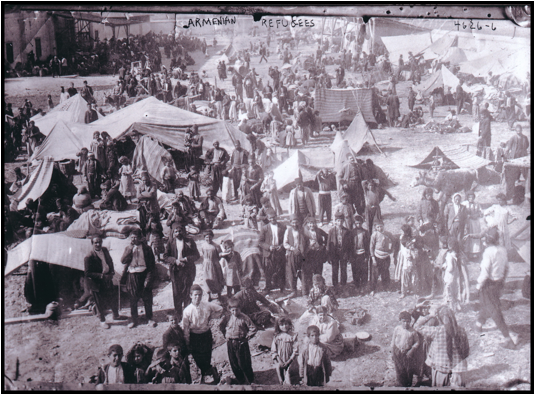 On verso of print of negative in PR 06 CN 133, Container 5, Folder 9: "Armenian refugees, Dec. 3, 1920" Forms part of: George Grantham Bain Collection (Library of Congress). To be extra cautious we sought the input of two German-speaking friends and scholars so as to be absolutely certain of any nuance we might have missed. “Speisung” literally is feeding (as in Quaker-Speisung for German school children in 1946 which I remember well.” … “A problem for the translator is that English does not distinguish between “dort” (there) and “dorthin” (there). It means that the “Armenians were rescued somewhere and then brought to the courtyard and were provisioned there.” We thank Dr. Jakob Schmidt and Dr. Allegra de Laurentiis for their kind help. 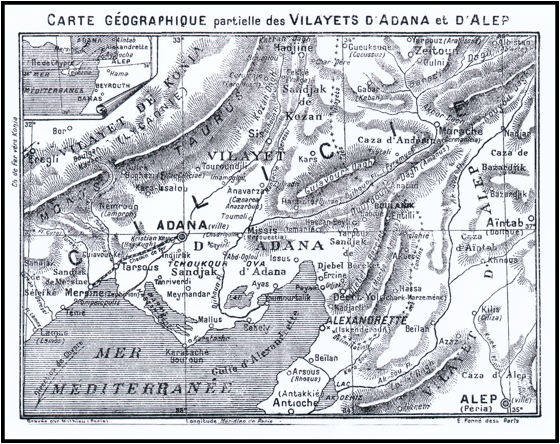 ‘Retten’ is ‘save’ and ‘verpflegen’, depending on the context, can mean ‘provide for’, ‘board’, ‘provision’ or ‘accommodate.’ Since we do not know much more about relief offered by Germans after the Adana/Cilician massacres, we cannot venture anything that would be other than speculative. The Deutsch-Levantischen Baumwolle-Gesellschaft mit beschränkter Haftung [acronym, GmbH; i.e. Ltd. was founded in 1904 - (cf. Offizieller Bericht den fünften Internationaalen Kongresses der Baumwoll-Industrie (Paris, June, 1908) pg. 278 in a report entitled “Die Baumwolle in Kleinasien [Cotton in Asia Minor]”. Fide “Die Baumwollfrage. Denkschrift und Verbrauch von Baumwolle. Massnahmen Gegen Die Baumwollnot” (Jena, Verlag von Gustav Fischer), especially pgs. 52-53. Attention is drawn to the adverse effect on cotton production during the period of the “Armenian unrest/troubles” [armenischen Unruhen]! We emphasize that it is of considerable interest that the author uses the today-unusual word “Aghetyalner@” in his caption Aghetyalner@hats g@ khntren yev hatsi Gtorner g@ Hapshtagen. The word Aghed [eastern Armenian Aghet] today is used in the context of a natural disaster, such as an earthquake, flood, etc. Never with human-caused atrocities, genocide etc. Aghed in old dictionaries describe aghed as a calamity or misfortune. Thus people who experienced or survived the Aghed would be designated as “Aghetyalner@”. 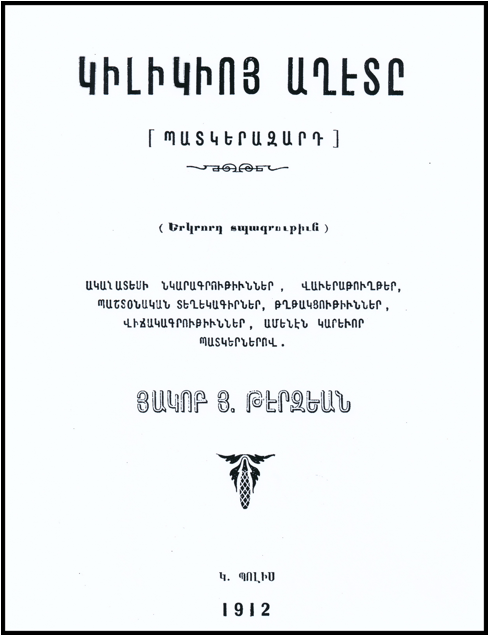 More recent attempts to analyze language as used in the context of genocide vocabulary as used by Armenians is beyond the scope of this paper but reference may be made to Vartan Matiossian’s “What our words mean: towards the vindication of Medz Yeghern” in The Armenian Weekly, August 2, 2013 . It may also be interesting to draw attention to a film “Aghet – ein Völkermord ” [Aghet – a Genocide] originally in German but now available on You Tube in English at https://www.youtube.com/watch?v=ybSP04ajCDg [1915 Aghet – The Armenian Genocide]. The Taderon/Gomidas Press’ Centennial release of a partial English translation of Terzian’s book as Cilicia 1909 [.] 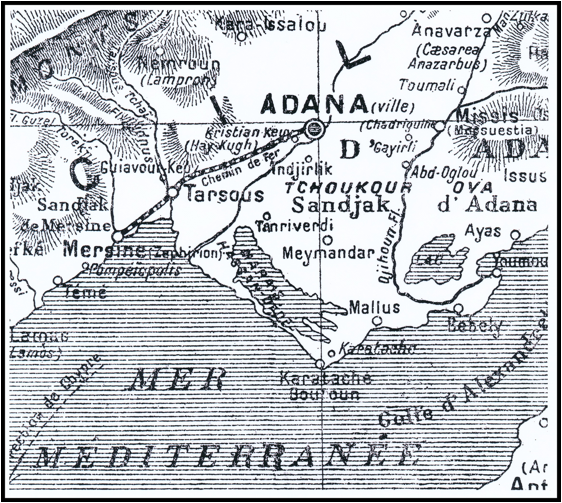 The Massacre of Armenians (includes a scan on page 56 of the ‘Adana relief image’. The translator Ara Stepan Melkonian and volume editor, Ara Sarafian, translate the caption from Terzian’s Armenian as “The victims ask for bread and grab pieces of bread.” This is hardly a very detailed caption on the part of the author Terzian. On a final note here, non-natural disasters, calamities, would never be referred to today as Aghet-related. We thank Siran Karapetian (born in Armenia) for discussing this concept with us in a broader context. We also thank her brother-in-law, our nephew John S. Gulbankian for his help in this matter.